General Grant had led a company in combat during the Mexican-American War, but resigned his commission in 1854. Then, in April 1861, the Confederate attack on Fort Sumter inspired him to volunteer to return to military service. He rose to Commander-in-Chief of all U.S. Armies in 1864-65 and took the surrender of General Robert E. Lee at Appomattox, Virginia, marking the end of the Civil War. His magnanimous decision to allow Lee's surrendered forces to keep their horses and return to their homes helped to begin healing the country. 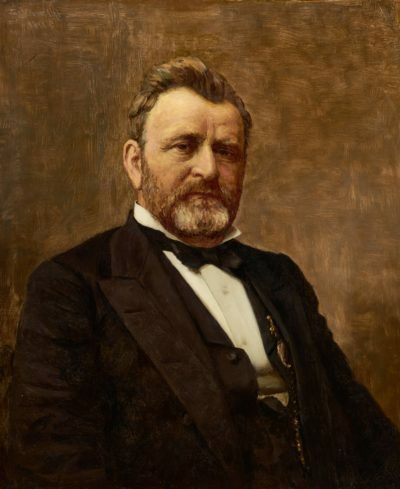 Grant oversaw the military aspect of Reconstruction until elected President of the United States in 1868 at age 46, the youngest elected president until John F. Kennedy in 1961. His given name was Hiram Ulysses Grant, but a mistake on his Academy Nomination by the Congressional office changed his name.